The car carries over many of its features from the A8 sedan. 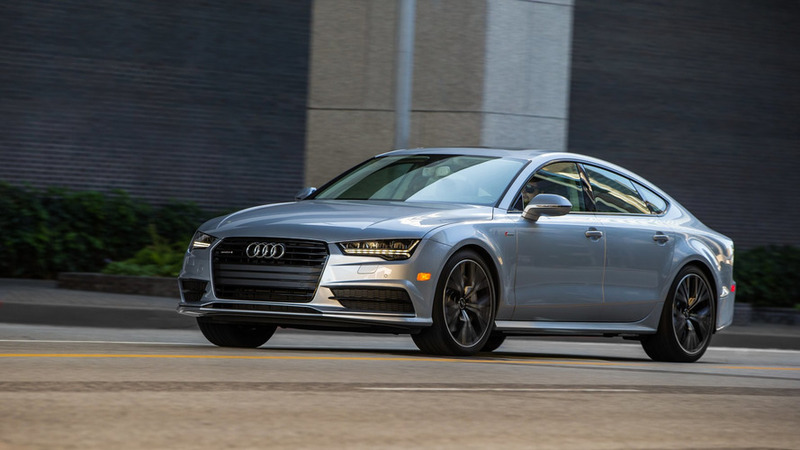 Sportback, four-door coupe, whatever you want to call it: the A7 is just plain pretty. 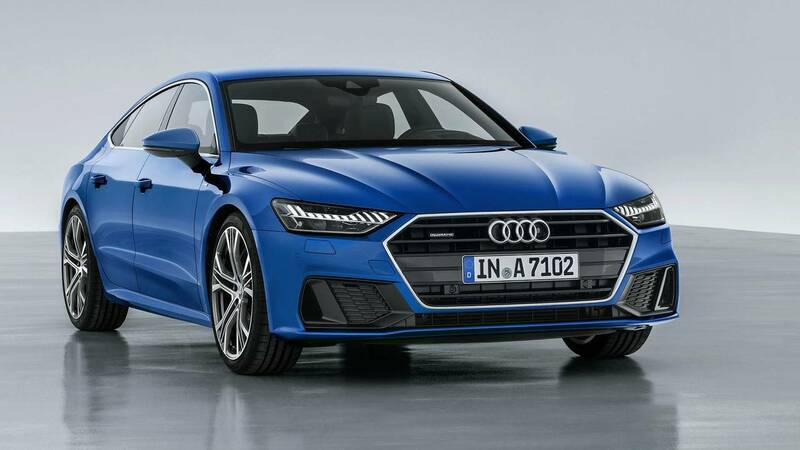 The all-new 2019 Audi A7, debuting this week in Germany, is somehow even more striking than the first iteration that stepped into the limelight seven years ago. At 195.6 inches long (0.6 inch less than before) but only 55.9 tall, the car appears to hug the road. 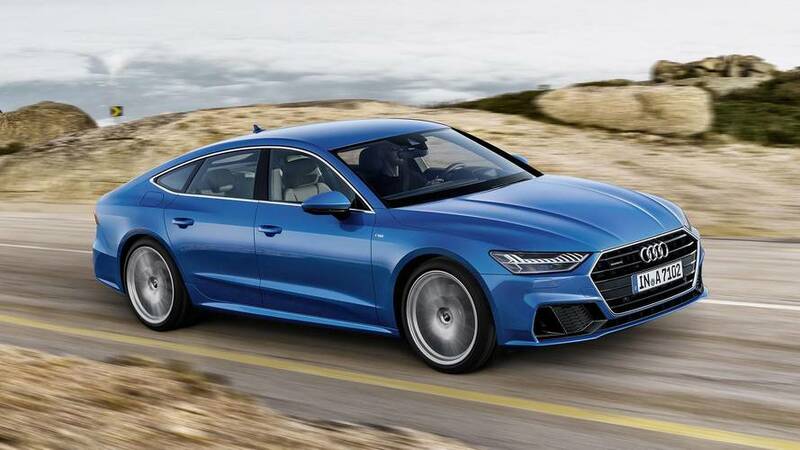 Its face has a wider, lower grille than on the Audi A8 – with which the A7 shares much – that promotes a sense of sportiness and aggression. Plentiful lines strake across the hood, leading over broad front fenders. 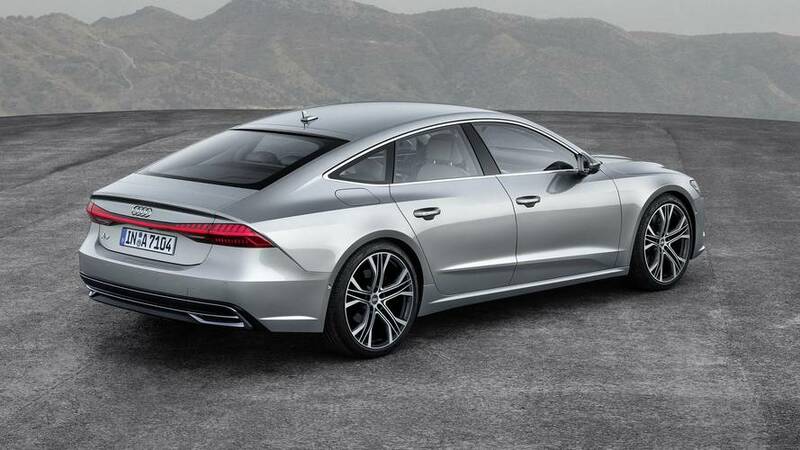 As on its predecessor, the A7’s roof is one sleek curve that plunges toward a pop-up spoiler (it raises automatically above 75 miles per hour) aft of the liftback. Under there you’ll find 18.9 cubic feet of storage, expanding to 49.1 cubic feet when the back seats are folded. A strong lower crease and a shoulder line that intersects the door handles break up the body sides, helping give the effect of a narrowing greenhouse and thus wide rear fenders. In fact, so wide are the rear haunches that the fuel-filler cap is practically horizontal. The full-width taillights are a real highlight, made of 13 individual strips of LEDs and varying in height across the width of the trunklid. Wheel choice will range up to 21 inches in diameter. Move inside and the sense of style continues with bold lines throughout the cabin. It’s light and airy, with broad horizontal lines and lots of angles breaking up the dashboard and door panels. Ultimately, the interior closely resembles what you’ll find in the new Audi A8 – and that’s a compliment to the attractiveness of the A7’s cabin. Rear knee- and headroom increase, because although the exterior length is down Audi says interior length is up 0.8 inch (21 millimeters). Both five-place and 2+2 seating options will be offered. So too does the infotainment technology carry over from Audi’s executive sedan, starting with the 12.3-inch Virtual Cockpit instrument cluster familiar from so many of Ingolstadt’s newest models. At the top of the dash, a 10.1-inch touchscreen – called MMI Touch Response – serves as the primary infotainment controller. A tiled home screen is your entrance point to myriad submenus for everything from navigation to music to vehicle settings. Below that, an 8.6-inch touchscreen acts primarily as the climate-control interface, but can switch to show a keyboard or a writing pad when inputting phone numbers or addresses. Based on our experiences thus far in the A8, all these systems should prove fast to respond, straightforward to use, and gorgeous to behold. The A7’s body and chassis utilize large amounts of aluminum, with lots of suspension and steering components designed for sportiness. Variable-ratio steering, for instance, is complemented by optional rear-wheel steering that can effectively shorten the car’s turning circle by 3.6 feet (1.1 meters). Depending on options, the front brake discs can measure up to 15.7 inches in diameter. And the standard Quattro all-wheel drive can be upgraded with a torque-vectoring rear differential. Active-safety gadgets abound, all managed by the zFAS (pronounced zed-fass) central computer that takes input from a sensor list that includes five radars, five cameras, 12 ultrasonic sensors, and even a laser scanner. Technologies include relatively common features like adaptive cruise control and lane-keep assist, while later on in the production cycle the A7 will be offered with Audi AI automated remote parking. The car can also read traffic signs and communicate with other Audis via vehicle-to-vehicle (V2V) communications. 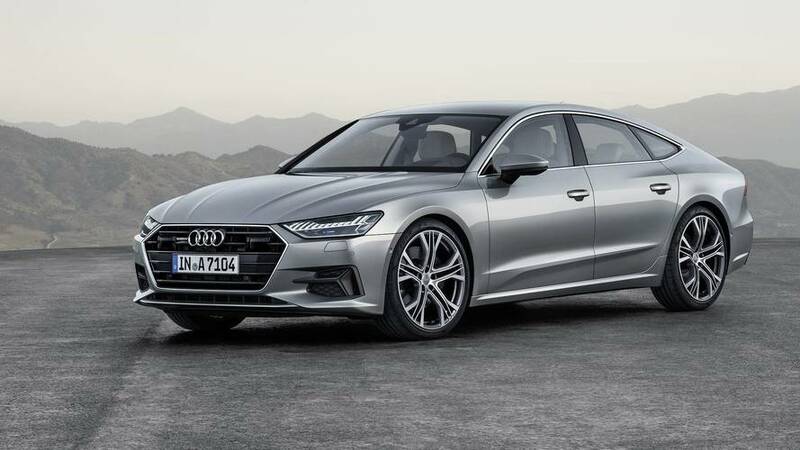 There’s no word yet from Audi on whether the A7 will ever offer the Traffic Jam Pilot system planned for the A8, which promises Level 3 autonomy – but only once legal regulations allow the system. Other optional toys include HD Matrix LED headlights with laser high beams, massaging front seats, an air-perfuming system, a Bang & Olufsen sound system, and a large panoramic sunroof. There will be four suspension setups: standard coil springs, a sport suspension that rides 0.4 inch (10 mm) lower, an adaptive option, and air suspension. The launch engine is the same turbocharged 3.0-liter gasoline V6 as is found in the new A8. In Europe it will be badged 55 TFSI under the company’s new power output-based naming scheme, though Audi says the two-digit numbering won’t be used on U.S.-market cars. it’s rated for 340 horsepower (250 kilowatts) and 369 pound-feet (500 Newton-meters) of torque. Also like in the A8, a 48-volt lithium-ion battery works with an upgraded alternator to provide mild-hybrid capabilities; the car can even coast with its engine turned off in certain situations. Audi says the hybrid system saves 0.2 gallons of fuel per 62 miles driven. 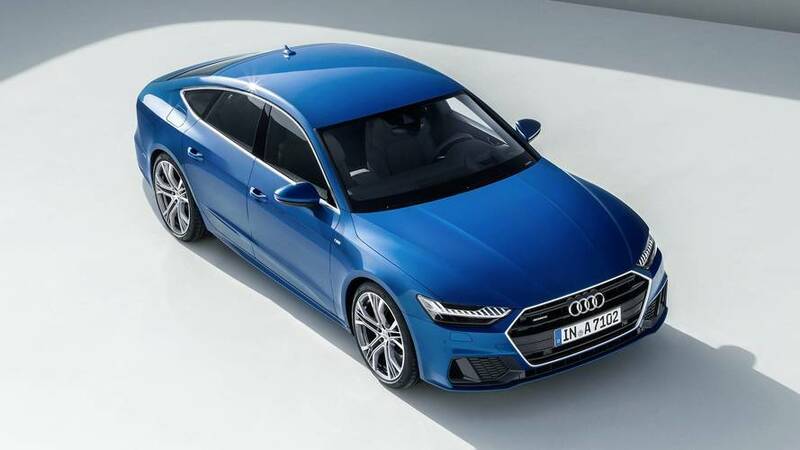 Where the cars diverge is in transmissions: the A7 will continue to use a seven-speed dual-clutch where the A8 55 TFSI packs an eight-speed automatic. That allows the car to sprint to 62 mph (100 kilometers per hour) in 5.3 seconds, with top speed pegged at 155 mph (250 km/h). Audi says other four- and six-cylinder engines, including diesels, will follow in the European market. The new A7 launches in Germany in February, and should reach the U.S. by the end of 2018 or perhaps in early 2019. Ingolstadt, October 19, 2017 – The A7 Sportback represents the new Audi design language to a great extent and delivers on the design promise made by the prologue studies. The four- door coupe sets standards in the luxury class when it comes to progressiveness. It embodies a new style of Gran Turismo, with dynamic lines, systematic digitalization, a sporty driving experience and a versatile space concept.